Rozella Pearl (Collins) Gammon, age of 95 years, passed away on Tuesday, March 26, 2019. Rozella was the fourth of six children, born Jan. 4, 1924, in the family home near Dederick, Mo., to Alma Lee (Galvin) and Ira Collins. Rozella attended elementary school at Willow Grove near, Dederick, Mo. 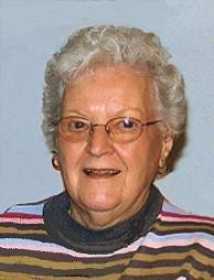 In 1941 she graduated from the El Dorado Springs High School, El Dorado Springs, Mo. Upon graduation Rozella moved to Kansas City and lived with her good friend, Dot (Porter) Spuhler and her family. While living in Kansas City, she was employed for a number of years at the H.D. Lee Grocery Wholesale Company as well as The Hallmark Card Company, of Kansas City. A few years later, Rozella moved back to the Dederick area, working for a time at the Tough and Son’s Hardware Store in Dederick, Mo. While working there she met her future husband, Floyd Ellis Gammon. Floyd and Rozella were married April 18, 1947, in Fort Scott, Kan. A few months later, Rozella started working at what was formally known as The Farm and Home, in Nevada, Mo. Around that same time, Floyd and Rozella formed a trucking and farming partnership, with Floyd’s brother, Harry Hubert Gammon. In 1953, Floyd, Harry and Rozella decided to lease the grain elevator in Harwood, Mo. In 1957, they made the decision to form a partnership and buy the elevator. This was the beginning of The Harwood Elevator. They were devout PURINA DEALERS for many years. They bought and sold grain to local farmers as well as handling other farming necessities for the rural community. Rozella was the sole bookkeeper and secretary at the elevator for 43 years, until they sold the business in 1996, to Mid-West Fertilizer. Rozella was very devoted to her family. She was extremely proud of the years when Stanton and Randy both worked at the elevator making it a true family business. Back then, the elevator was open six days a week, all year long, except during harvest — then it was open seven days a week, for as long as harvest lasted. They only closed for special holidays. Many adults remember going to the Harwood Elevator as children knowing —Rozella would always give them a piece of candy. Even when she was busy, she never forgot! Rozella was renowned for her pecan pies. Many have tried to duplicate her pies and her flakey homemade crusts but few have mastered her technique. She was a member of the Baptist Church in Harwood for many years. She was a past member the Harwood Helpers Club. More recently Rozella was a member of The Red Hat Club of El Dorado Springs, Mo. Rozella was very devoted to her friends as well as the community. She volunteered many years to help organize and work at the annual smorgasbord to raise money for The Land of the Osage Fire District. This fire district always had a special place in Rozella’s heart because her husband, Floyd Gammon, along with others in the community, was instrumental in getting it established. Three annual events were especially dear to Rozella. They were the “Galvin-Vickers Family Reunion” — “The Dederick Reunion” and “Apple-Butter Making Days” at Gary and Shirley Vickers home of rural Harwood. Rozella was a dedicated attendee and looked forward to going every year. Rozella never tired of visiting with everyone, including those she had not met before. She had the distinction of being one of the oldest, longest attendees for these events. Only her declining health stopped her from going. In July 2014 Rozella left her Harwood home and moved to The Morning Side Assisted Living Facility in Nevada, Mo. Even in her declining years Rozella never failed to ask about her grandchildren, by name. She leaves behind many family members, as well as numerous friends who have fond memories of her. She will be missed by many. Floyd and Rozella had one son, Stanton Ellis Gammon, born in 1949. In 1967, Stanton married Casseille (Fox) Gammon. They reside in the rural Walker, Mo., area. Stanton and Casseille have one son Randy Ellis Gammon (1967). Randy has four boys; Brandon Michael Barker (1996) – Devin Ellis Gammon (2003) – Jackson Austin Gammon (2007) and Lukas Randal Gammon (2009). Randy and his sons live in the outskirts of Nevada, Mo. She was preceded in death by her parents; all five of her brothers and sisters, Ira Eugene Collins, Erma Laudel (Collins) Hawkins, Charles Ralph Collins, Wilbur Donald Collins, and Bonnie Lou (Collins) Short; and her husband of 35 years, Floyd Ellis Gammon. Funeral service will be held at 10 a.m., Thursday, March 28, at Ferry Funeral Home in Nevada with Pastor Doug Reynolds officiating. Interment will follow in Mt. Vernon Cemetery, Walker, Mo. The family will receive friends from 6 to 7:30 p.m., Wednesday, at the funeral home. Memorials are suggested to Mt. Vernon Cemetery or Vernon County Cancer Relief in care of Ferry Funeral Home.